The White House wants to remove funding for US Department of Agriculture inspections of horse slaughter plants in the 2014 financial year, in a move that would leave the industry stranded in the starting gates. 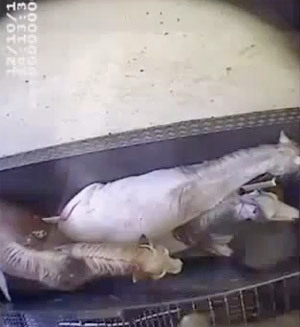 Six companies have in recent months been shaping to resume horse slaughter on US soil, applying to the agriculture department for the inspections which are mandatory for such plants. A similar spending prohibition on inspections was put in place in 2005, which effectively shut the door to the horse slaughter industry on US soil. However, it was not renewed in 2011, leading to the potential for horse slaughter plants to reopen. President Barack Obama’s 2014 fiscal-year budget proposal includes a request for Congress to block spending for horse slaughter plant inspections. The move has been strongly supported by the Animal Welfare Institute (AWI), the ASPCA (The American Society for the Prevention of Cruelty to Animals), and The Humane Society of the United States. Humane organizations oppose the slaughter of American horses for human consumption because they say the practice is inherently cruel. They argue that horse-meat poses a potential human health risk, as horses are not raised for food in the US and are consequently treated with several drugs not approved for use in animals intended for human consumption. ASPCA senior vice-president Nancy Perry said: “It is wonderful to see our government taking steps to ensure American horses are not slaughtered on our own soil for foreign demand, especially in light of the daily news from Europe about the horrors of discovering horse meat in their food supply from commingling with beef in tainted food products. The AWI’s Chris Heyde, deputy director of government and legal affairs for the organisation, said: “Now that the administration has taken this important step toward ending horse abuse, reducing the size of the federal government, and saving taxpayer dollars, we urge Congress to swiftly ensure this widely supported language is maintained when sent back to the president for his signature later this year. Great news! I’m glad that steps are being taken to protect the horses! I get so sick of the proslaughter promoters trying to portray it as a way to end any horse’s life. Horse slaughter was always sorted by blatant lies. I don’t care what other cultures eat as long as it’s not our horses. Not just that, with the drugs commonly used throughout their lives, it is a direct compromise of the food chain. It is also a horrible end to the horse’s life, honestly a betrayal. I hope that the federal bill passes and gets to our President’s desk for signature because THAT is the right thing to do.